Three of the the successful Stirling team pictured at last night's awards (l-r): Rachel Barr, Hollie Irvine and Martin Rowbottom. 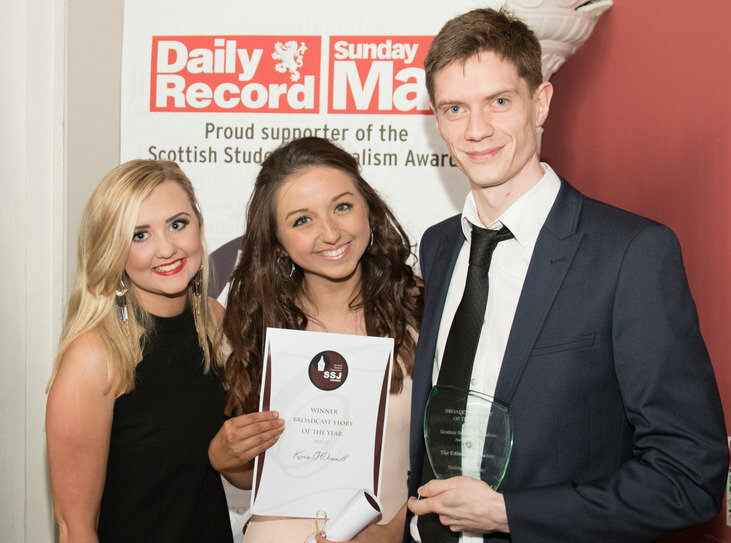 Stirling students are celebrating after their short film won the 'Broadcast Story of the Year' award at last night’s Scottish Student Journalism Awards. It is a repeat success for the University after Stirling students won the same award in its inaugural year in 2014. The six students - Martin Rowbottom, Hollie Irvine, Rachel Barr, Ismay Hutton, Cara Halliwell and Sean Hayman - from the University’s 'Introduction to Audio and Video Production' module won the award for their short film 'The Edinburgh Cowboy'. The film focuses on the work of Edinburgh-based American street performer, entertainer, magician and escapologist Todd Various. Hollie Irvine said: "We are overwhelmed and extremely humbled to win 'Broadcast Story of the Year' and to be commended for scoop of the year at the awards. "Thank you to the judges who voted, thank you to Todd Various who allowed us into his life for a few days, thank you to the Stirling’s Production staff, especially Dario and Michael, and we are sorry to those group members who couldn't make it last night! "We had a great night and appreciate the effort that went in to creating the awards and we’re so happy and proud to be a part of it. "We hope everyone gets a chance to have a look at the trophy when it goes in the new cabinet at the Pathfoot reception." The six students were also commended in the 'Scoop of the Year' category at last night’s awards. Dario Sinforiani, Head of Production Teaching, said: "I'm delighted that the hard work, dedication and talent of the production students has again been recognised with a national award. "It's fantastic for the group who made this excellent film, and also a great motivator for future students. "It's good to know that our students have produced work of such a high standard, and that a panel of industry judges has voted this film the Broadcast Story of the Year. We're very proud of the team." Last night’s success provides further recognition of the work of the University’s Division of Communications, Media and Culture. In last year’s Scottish Student Journalism Awards, Stirling students Mike Black, David Chalmers, Britteny Cox and Kirsty Graham triumphed in the 'Broadcast Story of the Year' category with 'A Different Shade of Amber', a short film profiling champion canoeist Amber Maslen. Earlier this year, Stirling students were honoured with three awards at Scotland’s annual Student Television Awards, winning the ‘Best Factual’ award, as well as ‘Craft Excellence in Sound’ and ‘Craft Excellence in Editing’ awards. Stirling’s renowned Communications, Media & Culture Division is part of the University’s School of Arts and Humanities. The University of Stirling was ranked top in Scotland for Communication and Media in the 2015 Complete University Guide. The QS World University Rankings for 2013/2014 also ranked Stirling in the top 150 universities worldwide for Communication and Media Studies.